Successor of Shabbethai Ẓebi; born at Salonica; died at Alexandria in 1690. He was a son of Joseph "the Philosopher" and a brother-in-law of Shabbethai Ẓebi. His sister, Shabbethai's widow, is said to have alleged, in order that Jacob might succeed to the leadership of the sect, that he was her son by Shabbethai. Assisted by Solomon Florentin, a learned Talmudist who had joined them, he gained a large following, and embraced Mohammedanism about 1687. He then made a pilgrimage to Mecca with many of his disciples, and died on his return to Alexandria. He was succeeded by his son Berechiah. Querido was regarded as the real founder of the apostate sect of Salonica which formally renounced Judaism and took the name of Dönmeh (Dölmeh). Another Jacob Querido, a contemporary of the preceding, was ḥakam at Middelburg, Holland, where he died at an early age. 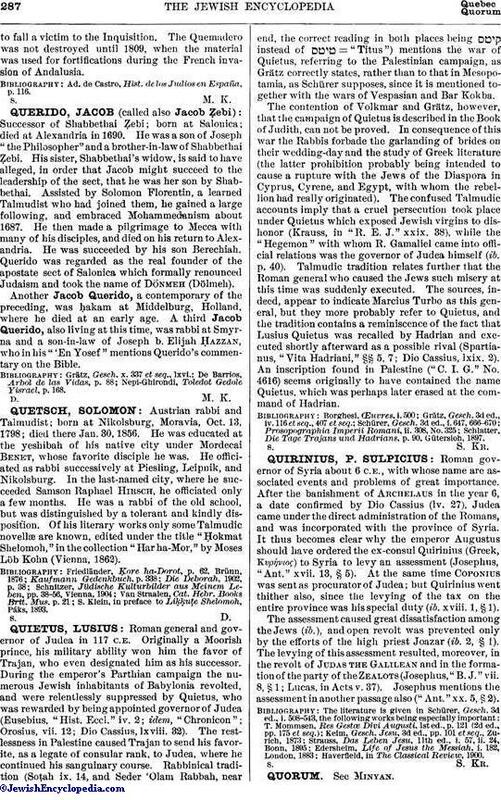 A third Jacob Querido, also living at this time, was rabbi at Smyrna and a son-in-law of Joseph b. Elijah Ḥazzan, who in his "'En Yosef" mentions Querido's commentary on the Bible. Nepi-Ghirondi, Toledot Gedole Yisrael, p. 168.